SYRACUSE, N.Y. -- The Red Wings and Chiefs split their twin bill Monday night at NBT Bank Stadium in Syracuse. 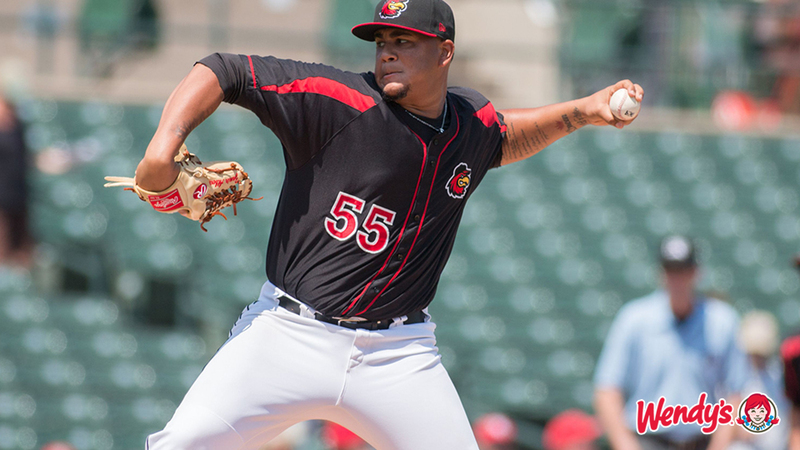 Adalberto Mejia pitched the Wings to a 4-1 victory in the opener, before the Chiefs walked off Rochester, 3-2, in the nightcap. After allowing a two-out walk in the first inning, Mejia (4-2) retired the next 14 straight hitters until a one-out infield single by former Red Wing Bengie Gonzalez in the sixth inning broke up the no-hitter. Mejia has now allowed two or fewer runs in each of his last five starts, going 4-1 with a 1.41 ERA over that stretch. LaMonte Wade provided the necessary offense with a three-run homer in the third inning - the first of his Triple-A career. With their win in the opener, the Wings improved to 20-2 when scoring 4+ runs this season. Game Two featured a battle of the bullpens. The Wings struck for a run in the third inning on a Jordan Pacheco RBI single in his first AB of the season for Rochester. Pacheco (2-for-3) was the only Wing to collect multiple hits in the nightcap. The Chiefs answered with a run of their own in the bottom half of the third. The game remained knotted at one until the eighth inning when Leonardo Reginatto scored on a wild pitch to put the Wings in front 2-1. However, Syracuse got a one-out RBI triple from Matt Reynolds in the bottom of the inning to tie the game. The next batter scorched one to first base where Kennys Vargas fielded and touched first for the second out of the inning, but as he attempted to throw home for the double play he tripped and fell allowing Reynolds to cross as the winning run. The Wings (36-37) have yet to sweep a doubleheader in six tries. Rochester is now 5-3 in extra innings this season. The series continues Tuesday in Syracuse with a 6:35 start between the Thurway rivals. Righty Zack Littell (1-3, 3.05) gets the start for the Wings opposite RHP Austin Voth (4-4, 4.06). WINGS THINGS: Willians Astudillo left Game One after being hit by a pitch…Wings manager Joel Skinner is not with the Wings this week in Syracuse as he's taking his mandatory vacation. Wings hitting coach Chad Allen is the acting manager for this series…Catcher Jordan Pacheco made his debut for the Wings after C Wynston Sawyer was put on the disabled list with a broken hamate bone.